I’m a bit of a planner and a bit of a computer/tech lover, so I’ve had a lot of fun creating my own version of a packing list for families. Excel spreadsheets are so powerful and fun, I knew I had to turn our basic Word doc packing list into an interactive, mathematically functioning, customizable spreadsheet. And I think I’ve achieved my goal! I’ve added some formulas into the cells (“boxes”) that are my own predictors of how many pieces of a certain clothing type you’ll need to bring based on the number of days of travel. I’ve also created multiple sheets (“tabs”) so each family member can have their own page. The nice thing about this, you can really make this file completely custom and unique to your own family. Below I’ll add some tips on how to edit the sheets for yourself so you can have the ultimate perfect packing list. Click on the green ‘X’ icon at the bottom of the packing list above to download the xlsx file. Add the name of the family member to the top Name field. Keep in mind: 1) If you’re planning to do laundry during your vacation, you might take that into account when choosing your number of vacation days; 2) special events days assume you’ll wear a new outfit each time, if you plan to wear an outfit again, deduct that from your days. 3) Lastly, I’m not a mathematician. This is a fun packing list that might need to be tweaked to fit your needs. It was created to help you in a fun and organized way to the best of my ability. I welcome your input on how I can improve this packing list! You’ll notice there are 4 tabs at the bottom (Adult Female, Adult Male, Kid 1, Kid 2). If you ‘right click’ on the tab and select ‘Rename’ you will be able to label the tab however you want. I’d recommend labeling them with each family member’s name. Remember to add a name to the top cell (“box”) of the page. To add more pages (“tabs”); right click and select “Move or Copy” then select the page you want to duplicate and make sure to check the box “Create a Copy”. You’ll see that the yellow cell in the image below has a formula (look at the white formula bar just above the sheet). This formula will be lost if you type your own entry in this cell. Consider saving one copy as a “master” once you’ve titled and organized it how you want. Then save a new copy for each trip that you can edit the numbers of clothing pieces on without losing the original formulas. If you want to keep each page to printing only one page, you need to check your Page Break Preview found up top under the “View” tab. By default, I’ve designed the pages to be one page. If you start making changes, you could end up pushing data onto additional pages, so keep that in mind. The other reason I like using the “View”->”Page Break Preview” is so you can see the Page Break dotted lines when you switch back to “Normal” view. When you click Print and see the Print box, you’ll want to pay attention to the options for “Print What”. If you want to print all the pages (“tabs”), then click the option for “Entire Workbook”. If you only want to click the page you’re on, click the option for “Active Sheet”. Note, the location of this option might be different based on what printer you’re using. 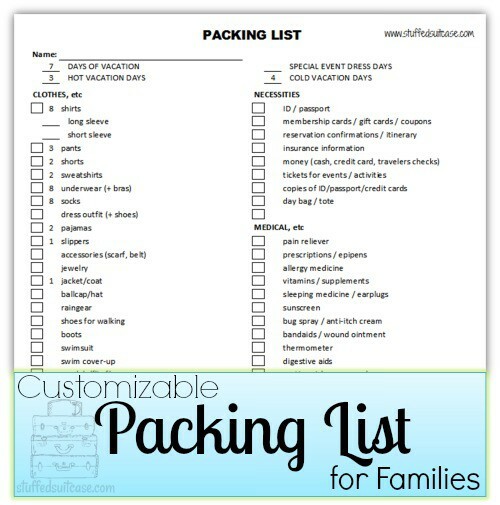 I hope this packing list will help your family. Please feel free to comment below or contact me if you have any questions. Be sure to check out my tips for How to Pack for a Road Trip, and Extras to Add to Your Cruise Packing List. You’re very welcome, Jessica. I really enjoyed creating it, but kept laboring over whether I had the right ratios. I finally just had to post it and let the users tweak it as needed. So fun to have a surprise vacation! :) Although I can see how it would be hard to plan for. I am a little obsessed with researching and planning, so I would feel really unsettled having someone else doing the planning. Let me know if you have any questions as the date gets closer. I’d be happy to give you some tips or pointers with whatever info you’re eventually given! Hi Nicole :). I’m glad you like it. I love the excel format but will soon be posting a basic print and go pack list too! Hope you have happy travels! Hi Carrie! Thanks for hopping on over! What a great organizing tip. As a fellow list-maker, thanks for this awesome template! Thank you for visiting Maria. Glad you like it! This will save me HOURS! I love, love, love making charts, but I thought I’d see if someone else had this same idea. I’m SO glad it’s done and ready and as sophisticated as I would like. It’s perfect! Just what I was looking for! Thanks so much for creating this! So glad it’s helpful Lisa! Have a great trip! You’re welcome Kristi! Glad it’s useful!! Great spreadsheet. Thanks for saving me some time. Great Rebekah! Thanks for visiting! This looks awesome, but I couldn’t get it to download. The link is gone. Bummer! Can you fix this on your end? If you save a copy to your own Google Drive can you then edit it? I can’t give everyone edit power on the sheet or else it could get a bit messy. I kept having trouble with the One Drive version so added Google, but now maybe that’s not working either! I have to get the document on my old laptop then I can directly upload it I think. Let me know if the save copy doesn’t work and I’ll find the original and send you the excel file. Thanks! This list is great, thanks! I’ve already started filling using and tweakeing it for our family cruise next month. Two additions that might be useful to all (I use them on every trip) are reusable water bottle and backpack/carryall bag. I’m looking forward to checking out more of your blog in the days to come! What a great way to help organize for a trip. Thanks for sharing these suggestions! Pinned. I would love to be able to access this packing list, but I don’t know how. Has it been moved or how do I download it? Wow! Never seen anything like this packing spreadsheet before. Thank you so much for sharing it. Now I have to go and try it out :) (The One Drive-link doesn’t seem to work any longer, but the Google sheet worked fine). Hi Katrin, glad you like the list! And thanks for the notice about the One Drive link! You’re welcome, very nice meeting you! Wonderful idea. However, I can not access the link. Is there anyway I can have access to this? Hi Michaela – Sorry about that! I had a setting change in my site and I think it affected my links for this. I’ve fixed the link, but also here’s the direct link for the download. Take care & happy travels! Thank you for creating this – it is my first vacation in 20+ years! Great Melissa! Thanks for all the input and hope you have a fab vacation! This is fantastic! I have created packing lists before, but not with the formulas. I love it! I am going to Europe and am determined to travel light, so I look forward to tweaking the “re-wear” aspect of the formulas. My one suggestion? That you include “Travel Days” at the top, as, at least for me, what I wear all day and back on airplanes can differ a lot from what I might wear during the trip. For example, on this trip I am wearing a wrinkle resistant travel pant for both overnight flights. Thanks again for sharing your genius! My previous packing list is on a differet computer and so I thought it would be faster to reload someone else list. I am glad I stumbled on yours as I have always wanted the number of days calculation to know how much and how many to pack of what. I think your portion is pretty close so I am glad you didn’t wait until it was perfect as every traveler is different. It was a good choice to leave it open for us to adjust to our needs. And we have the bonus of what you were thinking when you did the calculations to know if we have to adjust them for us. I love excel too and know some formulas but not to the degree of yours. Thank you for leaving your template open to tweak, I incorporated Stacy’s comment above by adding travel days separate from the trip days and incorporated that into the formulas. I even added a formula for how much money to bring by multiplying the travel days by a certain dollar amount because plastic is nice but cash is always needed on a trip. You made the world a better place but removing packing stress for some of us and if we are less stressed, then we can treat our fellow travelers with more compassion. Great thoughts and thanks for sharing Eve! I absolutely LOVE this template!! I downloaded it several years ago and have used it for ALL of our family trips since!! It’s a dream come true for this OCD, control freak Mommy!! Thank you! I know that packing could be assumed to be a “no-brainer” but for a full-time working mom of littles and travelling in a cold weather this is so awesome!